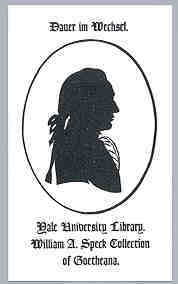 The Speck collection is one of the oldest special collections at Yale, containing material by, about, and relating to Johann Wolfgang von Goethe. For more information see the Guide to the Collections. The general cataloging policies for monographs and serials are followed. If the last page is unmarkable (e.g. too dark or shiny or filled with text or illustrations) , mark the verso of the first usable page from the end. Class as a name collection and use a sequential numbering scheme for monographs and serials new to the collection. For serials currently classed in Speck, add issues to that call number. The Speck cataloging manual, including guidelines for classification, is available as a pdf document. The first page contains an index of the manual, which links to the appropriate pages. The second page is a summary of the classification scheme and also links to the appropriate pages. The manual was last revised in 1970, and as a result contains extensive references to practices that are no longer followed, including the creation of catalog cards. Generally follow current cataloging standards with regard to description, access points, and subjects. Make added entries and subject headings for Goethe as necessary.